I found a vintage picture of a lady with bird hat at graphicsfairy.com and thought this could be used in August challenge at Pixie Dust Paperie. The challenge requires participants to create a project (layout, card, wall hanging, ATC, mini album, altered item etc) with an image of a girl or lady. I am using the freebie sentiment from tania-wildheart.blogspot.com. Too bad I don’t have foam dots to make all the layered fussy cut flowers and lace pop out..huhu! 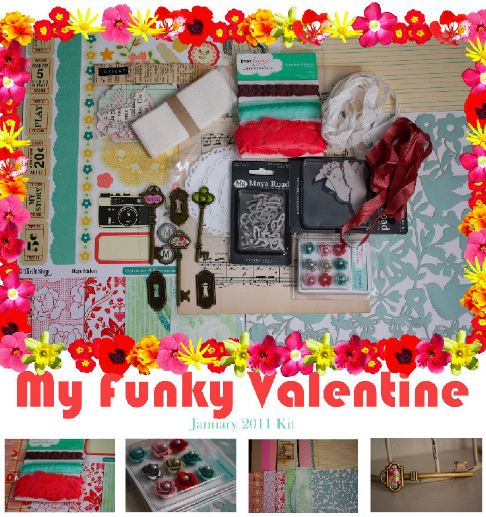 I am using PinkPaislee papers I got from Scrap-It-Lah challenge I won back in May 2011. 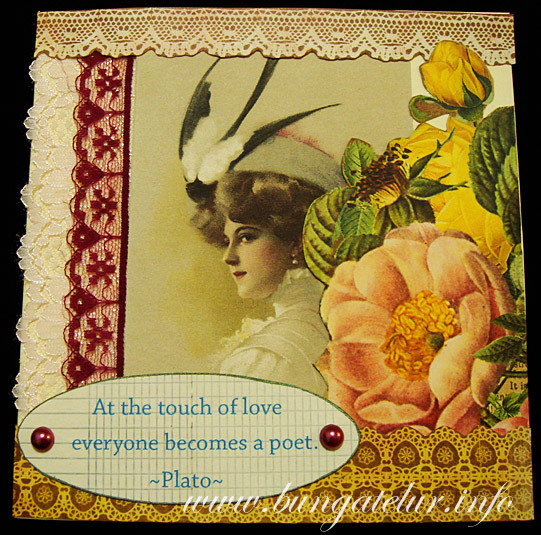 Oh, thanks to tania-wildheart.blogspot.com for sharing her wonderful freebies. 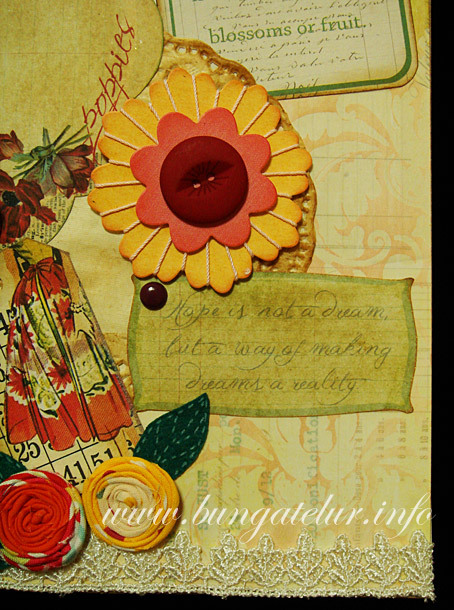 Those pieces you see on the cover – the bingo tag, the sentiment and the poppies note all are taken from her blog. 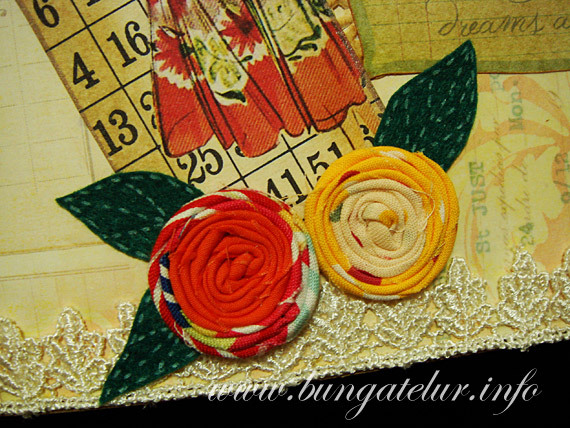 For those who have read my previous entries about these fabric rosettes, I finally made a smaller version with combined colored fabrics to suit the art journal cover size. For the leaves I used some pieces of green felt, cut free style into leaf shape. I used white pen to draw the faux stitches on the leaves. 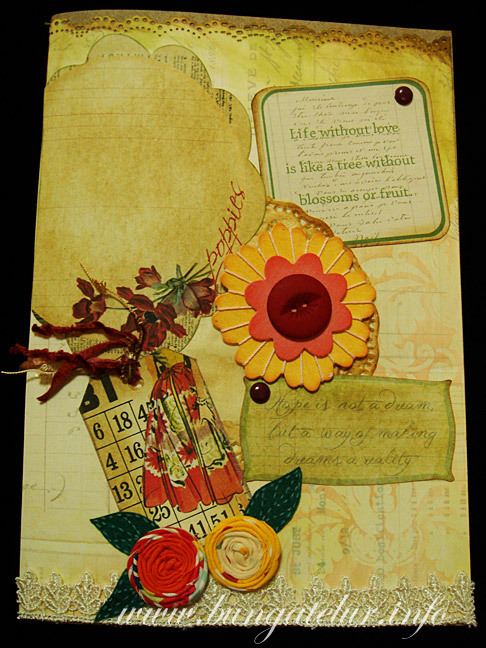 Thanks to Scrap-It-Lah for their wonderful gift (I won one of the challenges) and used here is an embellishment from the Sassafras entwined bloom – rosey and a paper from Pink Paislee House of Three line. I think it was Parisian Anthology divine damask paper. Check out the decorative ink resist front I used. For someone who yet to buy a heat gun, I have been hoping to do the ink resist technique for ages.